A bull elephant with a septic shoulder wound limped right up to a safari lodge on Lake Kariba and stayed there until a wildlife vet was able to dart and treat him. Was he asking for help? Staff at Bumi Hills Safari Lodge can't be 100% sure although it does look very much like it. The story of Ben the elephant - who did not succumb to what was probably a poacher's bullet - is a tiny ray of hope amid a gloomy catalogue of ivory poachings in Zimbabwe in recent months. 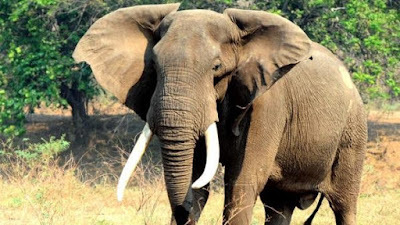 Nick Milne, the trust manager at the Bumi Hills Foundation, told News24 that the bull elephant, estimated to be at least 30 years old, made his way up a steep ridge to the lodge's staff houses on Saturday morning. He was limping, had two bullet holes in his ear and a septic wound on his left side. "Logic would suggest that if an animal has an injury that considerably hampers its mobility, it would not attempt the climb and would rather stay on the level ground near water," Milne said. Normally the lodge's own conservation manager is able to dart and treat injured wild animals. But he was away on business. Worried staff called for a wildlife vet to fly up from Harare, a distance of more than 300km. Six hours later when the vet arrived and was ready to treat him, the elephant hadn't moved further than a few metres from the houses. Said Milne: "The dart went into his rump perfectly and he only moved off a short distance in the seven minutes before he went down. He also landed perfectly on his haunches with his right side up a slope, the perfect position considering we needed to work on his left side." The vet and workers managed to clean and disinfect his wound, look for a bullet and administer antibiotics and fly-repellent, all in a little over an hour. A tracking collar was also fitted. Now Ben (named after the staff member who made the first report on the elephant and his injuries) is feeding and is hopefully on the way to recovery, though he's obviously still "in a lot of pain", says Milne. There are plans to dart him again in two weeks for a follow-up check and then keep on monitoring him - not least because those who treated him are mystified as to the exact nature of his wound. It looks almost certain to be a bullet wound, with a "large" entry hole that extends about 10cm down into the shoulder joint. But although metal detectors were used while Ben was under anaesthetic, the vet was unable to find a bullet, says Milne. If necessary a mobile X-ray unit will be brought in. Ivory poaching has reached alarming levels in the Sebungwe area of Zimbabwe, which stretches along Lake Kariba and includes nearby inland areas like Matusadona and Chizarira National Parks. Elephant numbers are estimated to have gone down by up to 75% in this part of Zimbabwe since 2001. For now, staff at Bumi Hills are elated that they've managed to save an elephant who appeared to have come looking for help. The fact that Ben walked right up the tricky path to the houses where help eventually came from may very well just be "coincidental", Milne conceded. "However, I believe that elephants are a lot cleverer than we are led to believe," he added.